The Mets have never been known as a team that steals a lot of bases. Yet if you look at their year-by-year stolen base totals, you notice that eight of the top 10 Mets teams in stolen bases also finished above .500 for the season. On the surface that may not seem so meaningful, but when you recall that only 20 teams in the franchise’s 50-year history have finished above .500, it is enough to make you sit up and take notice. That factoid becomes even more interesting when you consider that the 2012 Mets may not have the top two basestealers from 2011. Jose Reyes, who led the club with 39 SB, is a free agent while Angel Pagan, who had 32 steals, is a non-tender candidate. Those two accounted for 71 of the team’s 130 SB. Ruben Tejada is the most likely player to replace Reyes, and it would be a surprise if he reached 20 SB in a full season. There’s no clear-cut replacement for Pagan. Jason Pridie posted three straight seasons in the minors with 20+ SB but his career high is the 26 he stole in 2007 and it is very unlikely he would top that total in the majors. The Mets figure to get little to no SB production from catcher, first base or right field, barring a shakeup in the roster. Tejada, Jason Bay and David Wright would likely vie for the team lead on a team without Pagan and Reyes. While Wright did notch 34 SB in 2007, he has been under 20 the past two seasons and seems unlikely to threaten 30 thefts in 2012. Since making the World Series in 2000, the Mets have had six seasons where they had someone steal at least 30 bases and five where they did not. In the latter five years, they finished under .500 four times, the lone exception being the 2001 edition which went 82-80. On the flip side, the six seasons where they did have someone swipe at least 30 bags, they finished over .500 four times. The stolen base does not hold the place in today’s game as it did during the 70s and 80s when artificial turf parks littered the baseball landscape. We know now that if you’re not successful at least two out of every three stolen base attempts, you’re hurting the club. But if the Mets are not going to hit a bunch of HR, they need to do other things well to help them score runs. Since Reyes became a full-time player in 2005, the Mets have had a consistent speed threat. A 2012 lineup without Reyes will have the Mets struggling to find steals, especially if Pagan is not around to pick up the slack. Pagan has 69 steals the past two seasons and his 87 steals with the Mets is the 17th-best total in club history, three behind Frank Taveras. 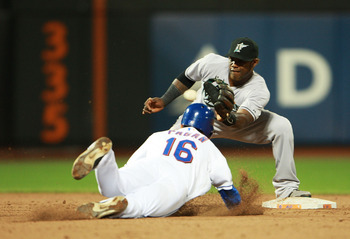 Reyes is the franchise’s all-time leader in steals with 370, which is the 92nd-best total in MLB history. ← Will the real David Wright please stand up?